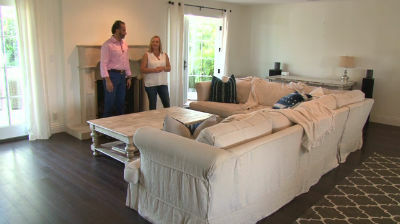 See how Stephanie Designs a beautiful beach theme home on the Mesa in Santa Barbara. Watch Stephanie Denier use her amazing talent to transform a family home to a Classical refined beach scenery. Located in the Santa Barbara area right by the beach side of town to have a perfect overlook of the ocean. For the living room Stephanie chose a sectional with washable and durable linen for the family and pets to enjoy. To add on to the beach look Stephanie picked a beautiful whitewash distressed coffee table and accessorized it with a candle , shells , books , and corals. For the office area she added a distressed office desk with few accessorize and a unique painting of the Santa Barbara beach by a local artist hanging right over the desk to set the theme. Last but not least the dinning area had an amazing Cristal chandelier handing over the french farm house dinning table along with a soft pattern rug for guest to enjoy.